We got together with Jac’s family for lunch on Christmas day. 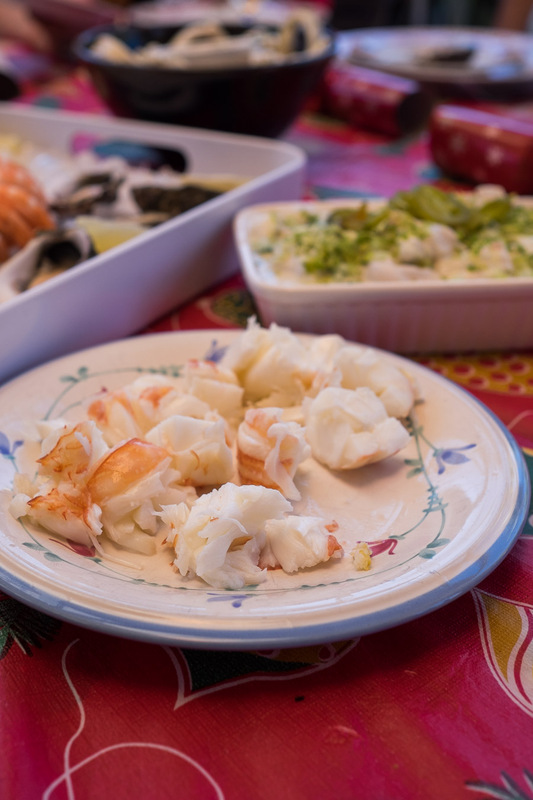 This year, Jac’s and my contribution to the meal was seafood for the first course. Jac did most of the work, though I did help with plating up. 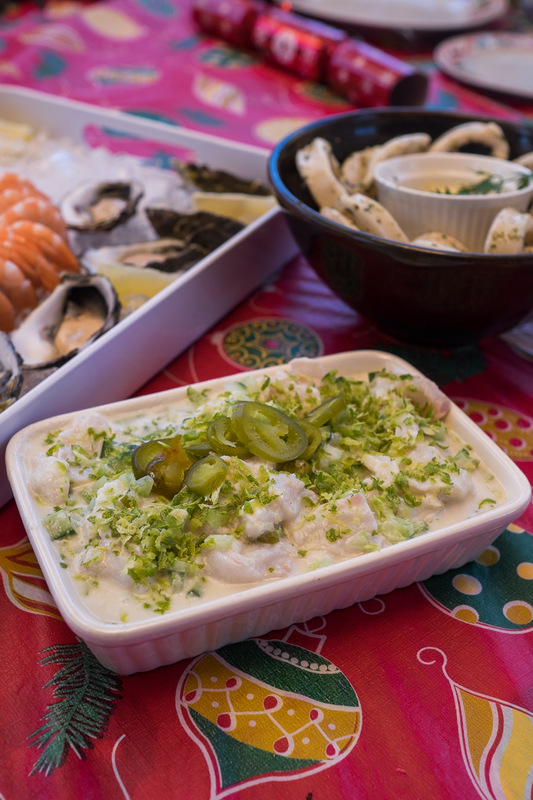 We served the seafood cold: cooked prawns (heads off, tails on) with seafood cocktail sauce, a dozen oysters natural with fresh lemon (Tabasco optional), a whole crayfish, calamari rings with a creamy garlic sauce, and especially for me, a tangy ceviche made with fish, coconut milk, lime juice and zest, cucumber and pickled jalapenos. 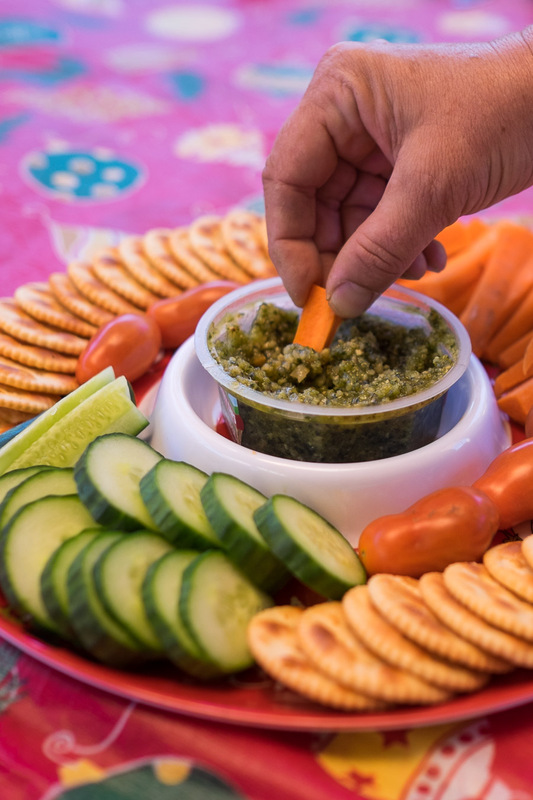 We crunched on vegetables and crackers with basil and cashew pesto dip before serving the seafood. 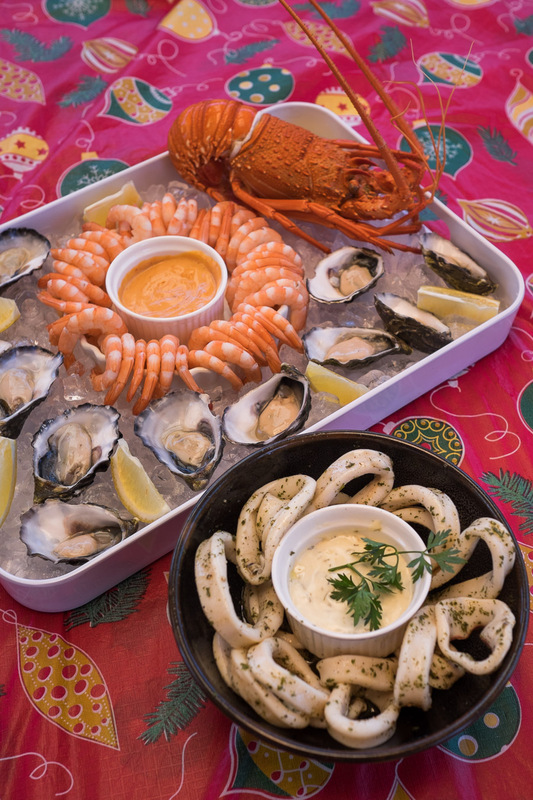 We served the prawns with seafood cocktail sauce, oysters natural with lemon and the crayfish on ice on one of our drinks serving trays. The marinated calamari with garlic sauce was in its own bowl. 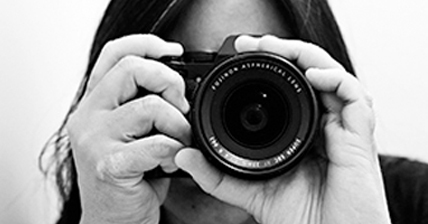 The snapper ceviche was conveniently placed right in front of me – I ate loads of it! The ceviche recipe was from Gourmet Traveller magazine and is actually for kingfish; Jac substituted with red snapper. She prepared the squid following a recipe for calamari salad from Epicurious – but she skipped the salad part. 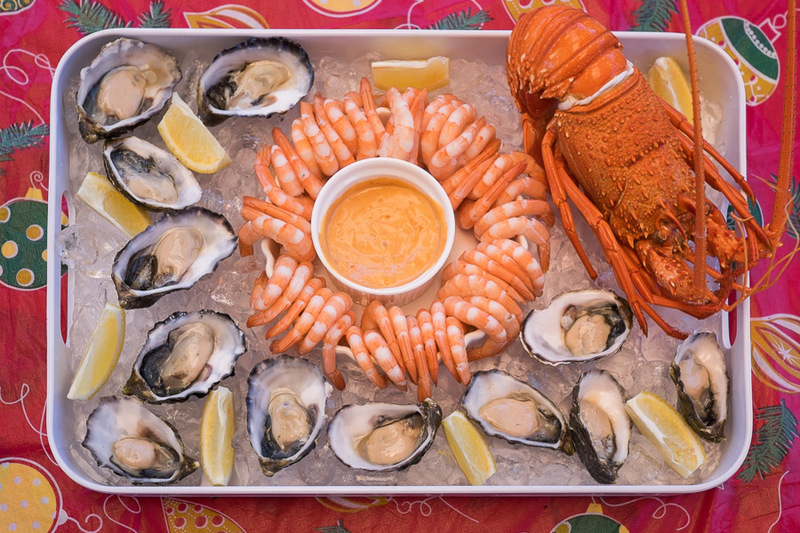 Jac got all the seafood from her friend’s shop, South Perth Seafoods – thanks for another great feed, Kylie. 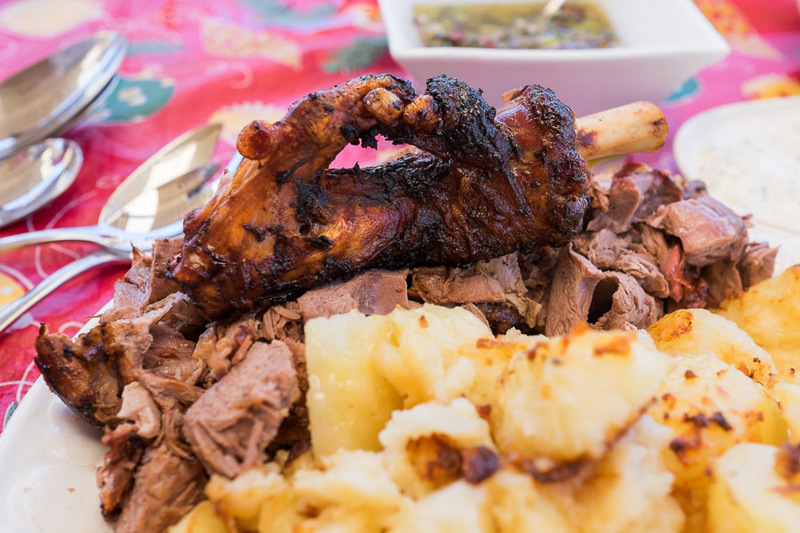 Main course consisted of three meats: a Christmas ham, mediterranean roast lamb served with yoghurt and mint sauce and salsa verde, a couple of succulent roast chickens, and duck fat roasted potatoes. We had a couple of salads – rocket, pear and Parmesan, and a layered salad with Mexican flavours, made with refried beans, tomatoes, lettuce, avocado, sour cream, salsa and cheese. There was a jug of brown gravy too. 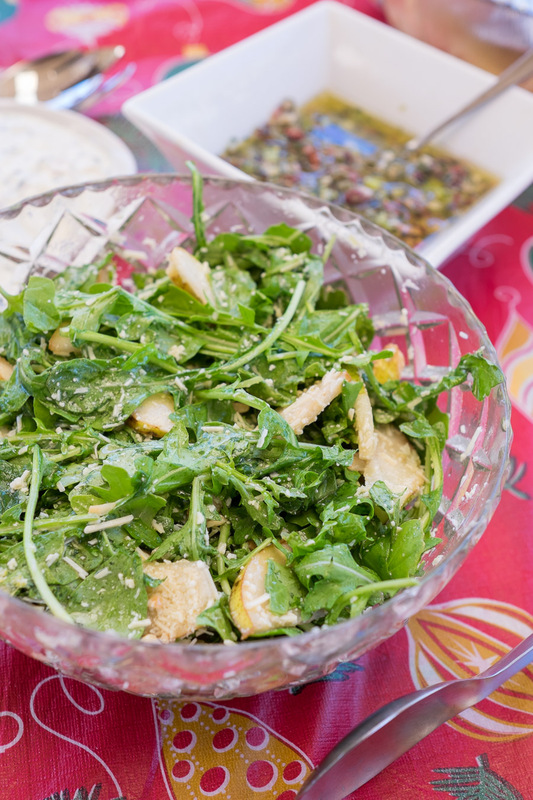 Rocket and pear salad. The Mexican layered salad tastes much better than it looks, so I haven’t included a picture. 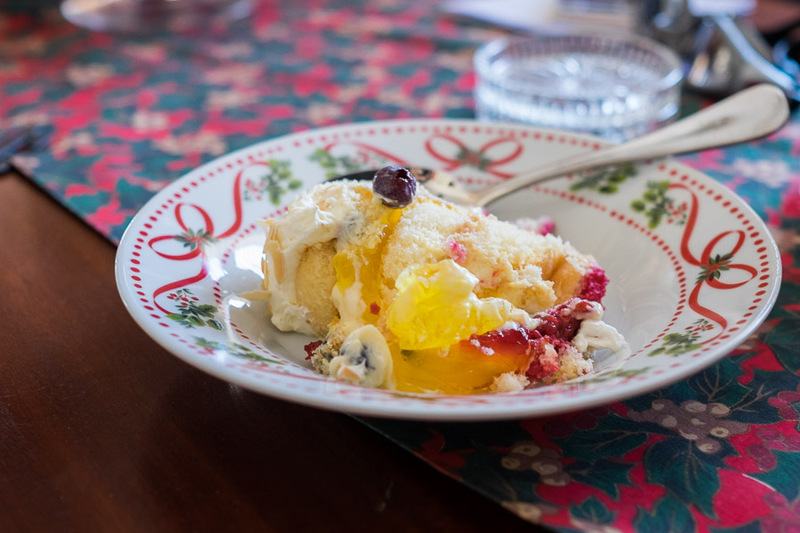 After clearing the table, taking a rest and exchanging gifts, we moved on to dessert – trifle and homemade fruit mince pies. 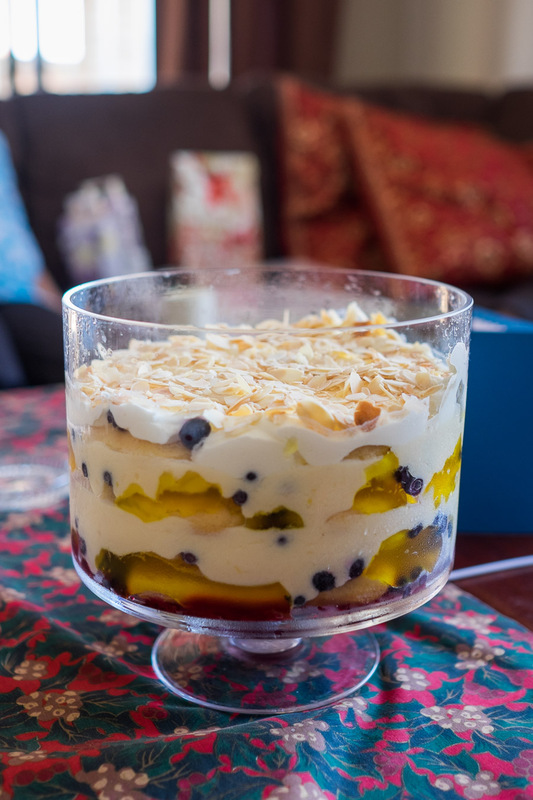 Jac’s brother’s wife Kelsie’s trifle was a beaut – layers of mixed berries, sponge, custard and limoncello jelly, topped with cream and toasted flaked almonds. 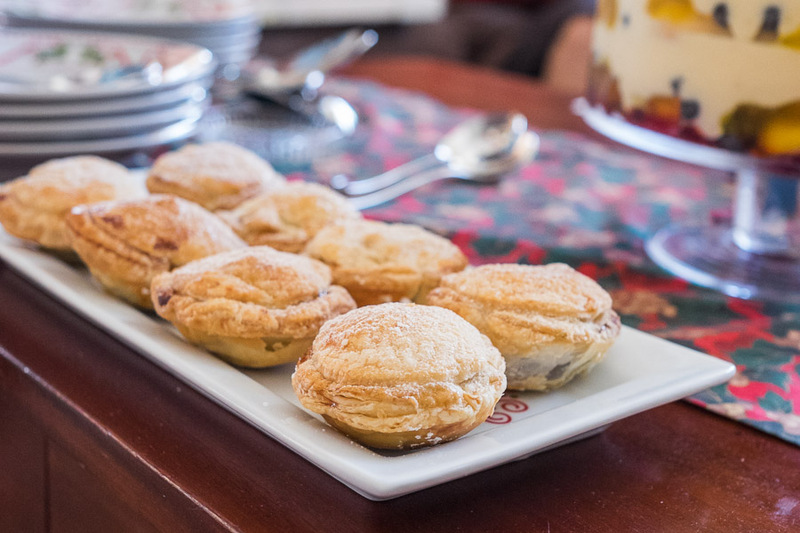 Homemade fruit mince pies made by Kelsie’s mum. They disappeared very quickly. This is NOT a complaint, but some years we end up with a huge amount of leftovers and get sick of eating them (end up freezing them). This year, I think we got the balance right. 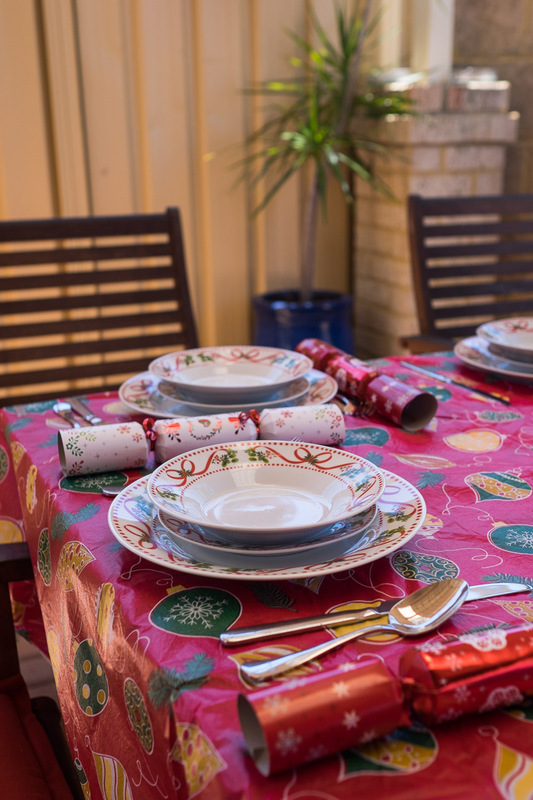 There was plenty to enjoy on the day and during the lazy days following Christmas, but without overdoing it – of course, it wouldn’t feel like Christmas without leftovers. 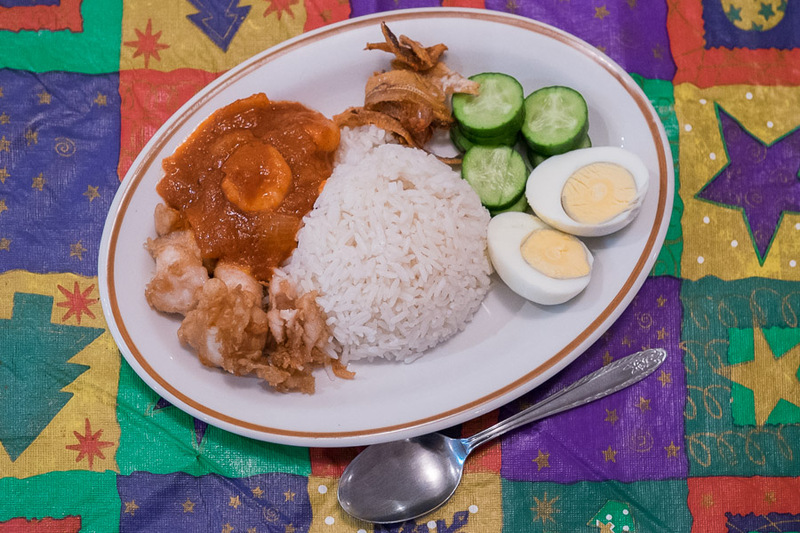 With time to cook, Jac got busy in our kitchen and used leftover prawns to make prawn and onion sambal to go with her first ever homemade nasi lemak. It was pretty good – I had seconds and ate more the next day! She’s keen to improve it and I’ll be right there to taste test, encourage and give helpful feedback. My first suggestion is that I get us some frozen pandan leaves to enhance the flavour of the rice next time (can’t get fresh pandan in Perth). Jac’s first homemade nasi lemak with leftover prawns converted into sambal. She also battered and fried snapper off-cuts which she didn’t use in the ceviche. We actually forgot to take our container of Christmas ham home with us – I was devastated when we realised! 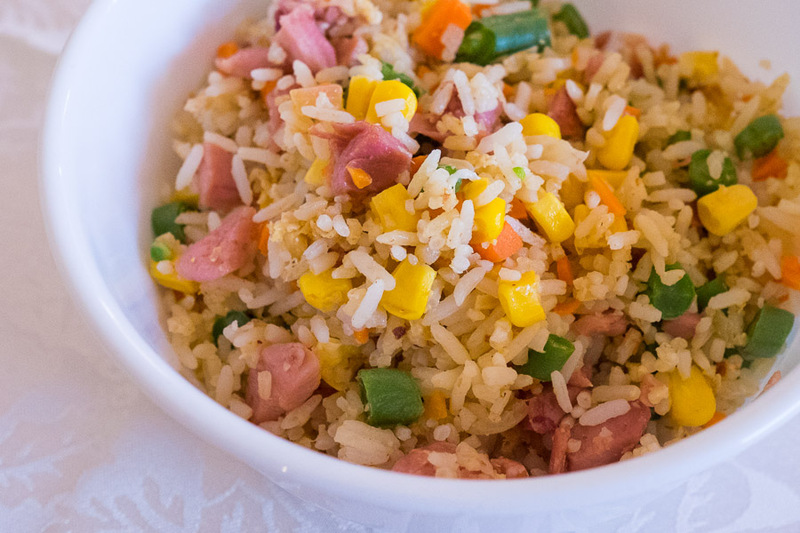 But Jac dropped by to pick it up the next day, and then cooked up a batch of fried rice using some of the ham. We still have a chunk of ham left, calling me from a shelf in our fridge – there’ll be a couple of rounds of Christmas ham, cheese and mustard toasties in my immediate future. Hope you had a good Christmas. 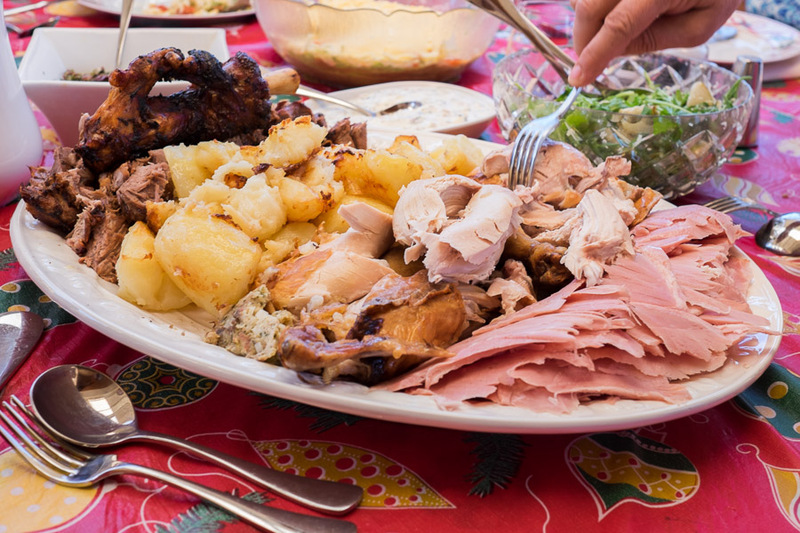 I’d love to hear about how you enjoyed/transformed your Christmas leftovers – feel free to leave a comment and upload a picture if you have one. Just under a month to go, and I’ll be back at work. That long service leave has flown by.